Meigs sophomore Bobby Musser leaps for a rebound attempt as teammate Zach Bartrum, right, boxes out a Vinton County player during the second half of Friday night’s TVC Ohio boys basketball contest in Rocksprings, Ohio. ROCKSPRINGS, Ohio — The Marauders made a run … then got ran out of the gym. 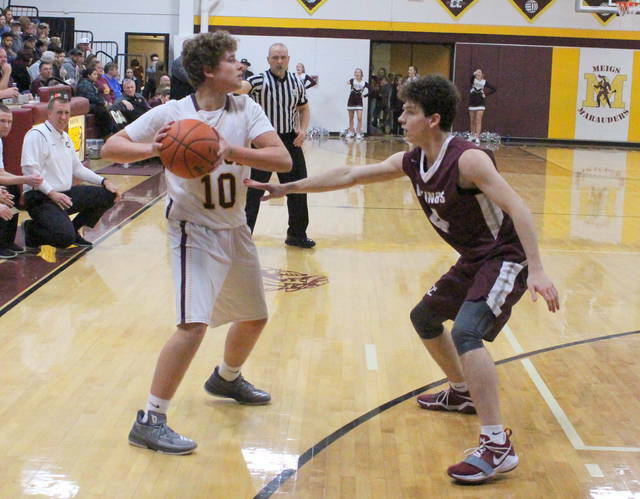 Visiting Vinton County made a 34-7 charge over the final 10:23 of the first half and ultimately rolled to a 65-47 victory over the Meigs boys basketball team in a Tri-Valley Conference Ohio Division contest at Larry R. Morrison Gymnasium in Meigs County. The Vikings (10-5, 7-2 TVC Ohio) jumped out a 4-0 lead just 90 seconds into regulation, but the host Marauders (4-11, 2-6) answered with 10 consecutive points while building a two-possession cushion with 2:48 left in the opening canto. The Maroon and Gray, however, received four points from Naylan Yates as part of a 7-2 run over the final 2:23, allowing the guests to secure an 11-10 edge through eight minutes of play. The Maroon and Gold never led again and missed their first five shot attempts of the second canto as VCHS made a 13-2 surge over five-plus minutes, giving the guests a sizable 27-12 cushion at the 2:27 mark. The Marauders twice closed to within 13 points, but the Vikings ended the final 1:07 of the first half with eight unanswered points while taking a 38-17 advantage into the break. 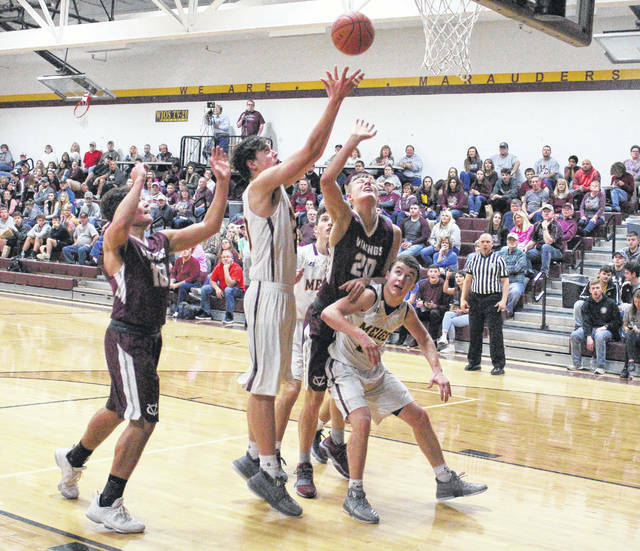 The difference in the 27-7 second quarter run came down to execution as Vinton County netted 10-of-19 floor attempts, while MHS was 3-of-16 overall to go along with eight turnovers at the half — twice as many as the guests. Weston Baer hit the opening basket of the second half, allowing Meigs to close to within 19 points — its closest margin of the third quarter. VCHS — which netted 12-of-19 shot attempts in the third stanza — answered with an 18-12 run over the next six minutes, then closed the final 38 seconds with six unanswered points en route to a 62-31 edge, the largest lead of the night for the Vikings. Vinton County cleared its bench in the fourth and missed its first 10 shot attempts as a result. 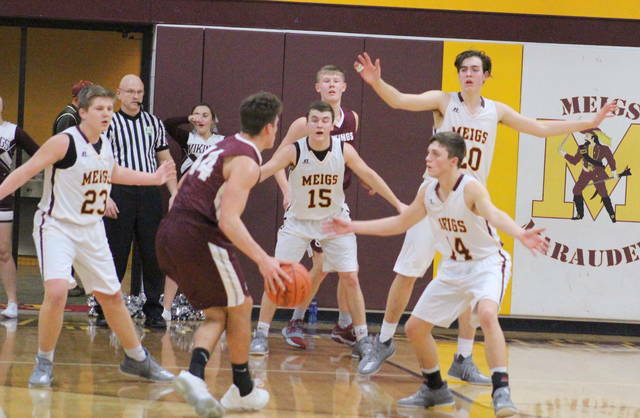 Meigs, conversely, four of its first five shots and went 7-of-15 from the field during a 16-3 surge down the stretch — which ultimately wrapped up the 18-point outcome. The Vikings claimed a season sweep of Meigs after posting a 55-39 triumph in McArthur back on Dec. 19, 2017. The Marauders also fell to 0-4 in home contests this winter, with three of those losses coming by double digits. The Maroon and Gold finished the game with 14 of the 24 turnovers committed, but did claim a 42-39 advantage in rebounds — including a 16-14 edge on the offensive glass. The Marauders connected on 19-of-62 field goal attempts for 31 percent, including a 3-of-11 effort from behind the arc for 27 percent. The hosts were also 6-of-15 at the free throw line for 40 percent. Baer led Meigs with a game-high 21 points, followed by Bobby Musser with eight points and Zach Bartrum with seven markers. Wyatt Hoover was next with six points, while Jake Roush and Austin Mahr respectively completed things with three and two points. Musser led the Marauders with a game-high 16 rebounds. Hoover was next with seven boards, while Bartrum hauled in five caroms. Vinton County netted 27-of-64 shot attempts for 42 percent, including a 3-of-19 effort from three-point range for 16 percent. The guests were also 5-of-12 at the charity stripe for 42 percent. Yates led the Vikings with 20 points, followed by Jake Speakman with 17 points and Bryce Damron with 10 markers. Cameron Hamon was next with six points and Eli Griffith tacked on four markers. Nevan Yates and Bailey Bartoe were next with three points each, while Will Arthur completed the winning tally with two points. Griffith led the guests with eight rebounds, followed by Hamon and Naylan Yates with seven caroms apiece. Meigs returns to action Tuesday when it hosts Point Pleasant in a non-conference contest at 7 p.m.